Discover the new look and feel of our Appspace 7.0 platform here. 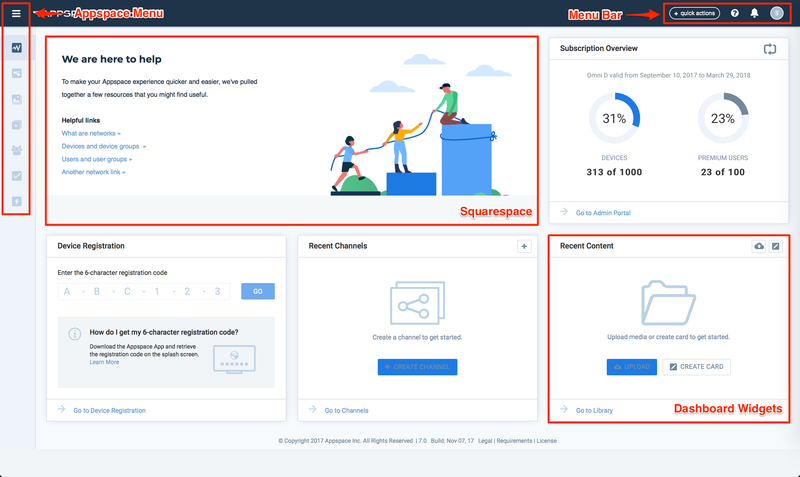 Appspace 7.0 introduces a brand new user interface and menu navigation that has been updated with a streamlined design for improved user experience. The Appspace console dashboard is designed around a brand new UI architecture. The scalable architecture provides easy navigation for first time users, with workflow shortcuts that allow users to directly jump into their respective areas of focus. The dashboard also displays personalized widgets streamlined and customized for the user that has logged in. Some Dashboard widgets may not be displayed due to user permissions. The following describes the control buttons on the Appspace menu bar. Our all new interface now includes a cool new feature - the Quick Actions menu, located in the top navigation bar, which provides shortcut links to key workflow areas in the Appspace console, to help you quickly create a card, a channel or even register your device. Click this little contextual Help button for short descriptions of the feature/page that you are in. It gives you an insight of what you need to do. Some pages also include links to our Appspace Knowledge Center with comprehensive help articles. This button displays notification alerts on user activity, user group or user invitation activity, or content approval requests. Use this button to view your user profile. You may also switch networks, view the user roles assigned to you, and change the default language. The streamlined Appspace menu, a drop-down list on the top left corner of the Appspace console, is now available with a clearly visible side navigation bar. The availability (and visibility) of these features vary depending on your subscription type, deployment type (cloud or on-premises), or user role. 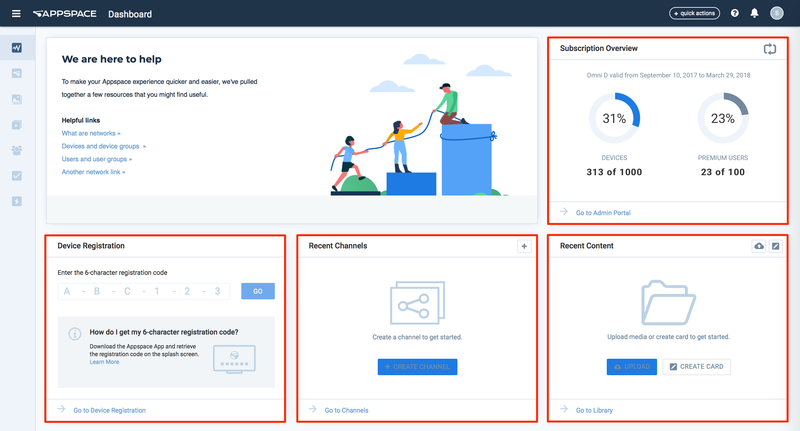 Upload content such as cards and media in simple playlists, stream and broadcast live videos with a live channel, or create advanced channels with scheduling and custom layouts; all here in Channels. Organize these in channel groups and view them in interactive mode via your Appspace App. Create fully customizable cards, upload images and videos, and add links to external content such as web pages in the Library. Organize your content privately in folders, or in individual libraries for each user group you belong to, and share with your peers. Manage all your devices and networks in one place in Devices. Register devices and categorize them in device groups with tags, and assign channels to the devices. Also create networks and sub-networks for users in your organization, and set permissions. Monitor, manage, and configure your devices using task templates provided by Appspace in Device Tasks. Some tasks available are changing the default log level, updating the device firmware, installing custom fonts, rebooting a device, or sending RS232 commands. Alerts is where you create important or emergency announcements, which are broadcast via advanced channels. The Admin group sub menu contains features such as Reports, App Configuration, and Settings. Create reports such as user activity logs, and proof-of-play metrics for specific media zones in an advanced channel. In App Configuration, administrators or Account Owners can make additional configurations such as adding new EPG providers, remote control profiles, and changing the Appspace App background theme. Administrators can customize their Appspace domain, configure Single Sign-On (SSO), or view your subscription plan and global ID usage information, in Settings. The System group contains additional system and server-wide accessibility, and configuration options, that include Downloads, Cards, Configuration, Languages, Server License, Deployments, and such. If you are on Appspace Cloud, you may only see some of the features listed. Administrators can customize themes and templates according to your organization’s corporate colors, fonts, imagery, and styles, and lock these changes, making it easy for your users to create cards with a predefined template in the library. You can download several installers and guides in this space. Availability depends on your subscription. Here you will be able to see all your on-premises instances that have been activated.